The Gunpowder River is flowing at 215 CFs, is clear and 58 F. With more rain, (and spillover) in the forecast, the river should bump up a bit and level off through the weekend. Water temps are in great shape, flows are close to twice the median, (over the past 11 years) and the wild fish have been very active this week. Streamers and heavy, double nymph rigs have accounted for a number of chunky fish from Masemore through Bunkerhill Rd. Watch your step and be sure to bring a wading staff as we still have lots of debris strewn across the trails, the banks are soft and in some areas the gravel is still on the spongy side. Your suggestions last week were spot on – the river was trying hard to return to normal after the flood and I had a fine time. Looked at Bunker Hill upstream and decided that between the higher flows, muddy banks and trails, that fishing Masemore was a better bet for me. Caught three nice Gunpowder browns on the hoppers you recommended. One of the fish came up, looked over the hopper and then very gently took it – and another smashed the hopper and then took off on a nice run. The water was still a little off color and I only saw a few bugs (maybe caddis?) in mid-afternoon. Thanks for the always great advice. This entry was posted in fishing report on September 23, 2011 by Theaux Le Gardeur. After back to back storms from Hurricane Irene and the remnants of Tropical Storm Lee, the foot trails in the Hereford Area of Gunpowder State Park and the TCB trail could use a few helping hands. 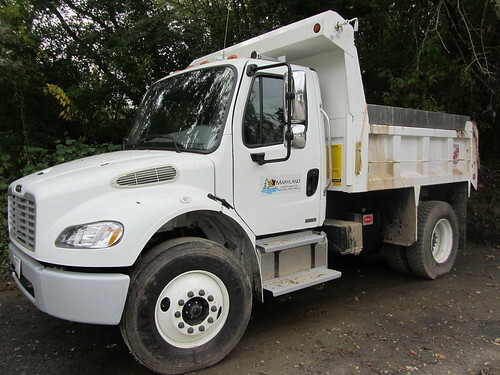 Staff from Backwater Angler and volunteers from Gunpowder RIVERKEEPER® will be conducting cleanups along the river and in the park throughout the rest of September and October. Thanks to Ranger Sarah Witcher from Gunpowder State Park for the kind words and support in prioritizing areas for the post-storm cleanups. Thank you so much for the offer of help! After discussion with the staff up North, we have a few ideas for you and your volunteers… We are so grateful for your help! As I’m sure you can imagine, we are just swamped with projects that resulted from flooding and winds in the recent storms. Let us know what dates you plan and if any staff is available, we will certainly do our best to meet your volunteers and cheer them on! As Ranger Witcher suggests, please register with the volunteer database prior to helping the cause and follow Leave No Trace principles. For a list of areas that are high priority, and guidelines for the work at hand, please contact us at keeper@gunpowderriverkeeper.org. This entry was posted in news on September 22, 2011 by Theaux Le Gardeur. 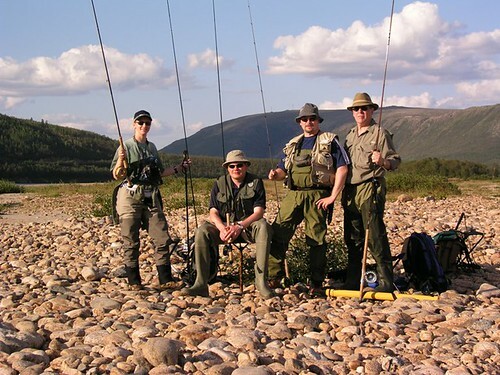 Please join us for a flyfishing school. On Sunday, October 9, a Backwater Angler Guide will be teaching a fly fishing school that is ideal for beginners. If you’re planning on fly fishing in Maryland, or anywhere else for that matter, this course is a great introduction to the sport. 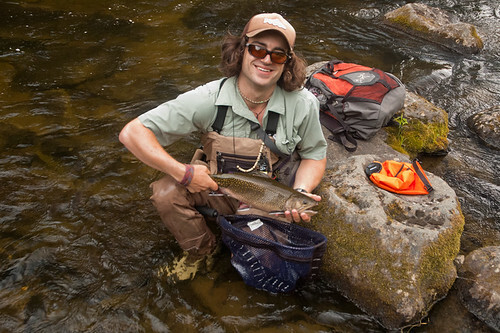 The school covers knots, casting, gear, fly selection and an hour of on-stream instruction. Schools are held in a meadow overlooking the Gunpowder river by a Maryland state licensed and insured fishing guide. Class is held from 11:00 AM till 2:00 PM. Cost is $100 per person and includes the use of gear. A Maryland non-tidal fishing license and trout stamp is required and may be purchased prior to the class with check or cash at the shop. Class size is limited to 4 and pre-payment is required. Please give us a call at 410-357-9557 or drop us a line at info@backwaterangler.com to register. The Gunpowder river is flowing at 240 CFs is clear and 56 F. Folks have been venturing out this week with streamers, large terrestrials and a few tricos. The river post-storm is still moving right along at about twice the median flow. If you’re coming up to see the newly revised river, limit your wading and plan on using the trails to get around. Tricos and olives are about mid-morning from Lower Falls Rd to Bunkerhill. If you’re imitating the small stuff be sure to use a 12 ft leader as it’s tough to get a decent drift in such high flows with anything shorter. We’ve lost a number of wader wash stations along the creek and have spoken to the Ron Klauda from the Invasive Species Task Force about getting some replacement stations and we’ll be moving a few to service high traffic areas in the next day. Here’s a note from a returning staff member, Jennie Lindqvist. A Towson geography grad originally from Finland and now a Monkton resident, (pictured on the left fly fishing the Teno River, Finland) is getting reaquainted with the Gunpowder after spending her fair share fishing for salmon in her home waters in Finland. After last week’s floods the Gunpowder river is returning to fishable flow. The water should be back to its gin clear state in the next few days. With cooler weather, the Gunpowder should be ready for some prime fishing this weekend. We’ve had reports of good catches on streamers, San Juan worms, and beetles. Please be careful accessing the water as the banks along the river can be steep and soft from the erosion caused by the flooding river. This is a good time to make use of a wading staff to keep yourself steady. A wading staff will also help you check the depth of the water and locations of any new holes that might have been created. Backwater Angler is working with the State Park to organize a clean up effort of the trails and other areas soon. We will post the information as soon as it is decided upon and hope to see many anglers joining the effort. This entry was posted in fishing report on September 16, 2011 by Theaux Le Gardeur. 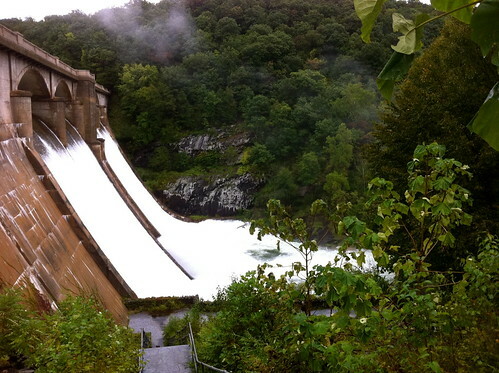 At one o’clock yesterday the Gunpowder river was flowing at 1,840 CFs, (7.8 FT), and was 70.7 F at Falls rd. The National Weather Service rainfall totals left by the remnants of tropical storm Lee were 9.2 inches in Parkville. The highest flows recorded during this spillover event were 11.62 feet measured at Falls Rd-we don’t have a relative Cfs for this river height yet but it’s likely well over 2,500 CFs. Roads are closed along the lower river and with good reason. The Gunpowder River is lapping against houses along Falls Rd between Monkton and Corbett. Provisional #’s from USGS put flows at Little Falls, a tributary of the Gunpowder that enters at Blue Mount Rd at an estimated 6, 180 CFs and 13.96 FT. More provisional #’s from USGS indicated flows at Lower Glencoe Rd were 4,470 CFs and 12.8 FT. In short the Gunpowder is over it’s banks, deep, fast moving and very dangerous at present. Pictures from Adrian Kostrubiak’s SKICLIMBFISHBUM.com show mayhem–Gunpowder River water pushing over Falls Rd, flows over street level at Masemore Rd, the absence of the pedestrian bridge over Bush Cabin run and water reaching the bottom span of the new bridge at Big Falls Rd. Thanks to Willy for the note and update about conditions along the new bridge over the Gunpowder at Big Falls Rd. I hope all’s well with you after the deluge. This entry was posted in fishing report on September 8, 2011 by Theaux Le Gardeur. The Gunpowder River is flowing at 120 CFs, is clear and 52F. Sustained winds through last Sunday worked on the shallow rooted trees along the banks of the Gunpowder leaving some new jams. Prior to the storm Gunpowder River flow was 117 CFs and 51.8 degrees F. While Irene only brought 4.59 inches of rain locally, a spillover event occurred at Pretty Boy Reservoir over the weekend accounting for high flows of 264 CFs and Gunpowder River water temps of 66.7 F. Monday flows and temps dropped along the river to 203 CFs and 62 F. Fly Fishing as flows are moving down is a great way to connect with larger fish. This weekend flows should stay close to the 120 CFS range- a great flow to get out and try your luck with Tricos, beetles and caddis. The shop is only 21 miles from the Baltimore Grand Prix, so if the drivers point their cars north, it should take them all of seven minutes, (at 180 miles an hour) to stop in the shop and try their fine motor skills on tricos mid-morning and still have plenty of time to put in some warm up laps in downtown Baltimore before attempting turn one. Saturday and Sunday from 10:00 AM till 4:00 PM. Labor day is upon us, and we have dry flies on parade along the Gunpowder River. 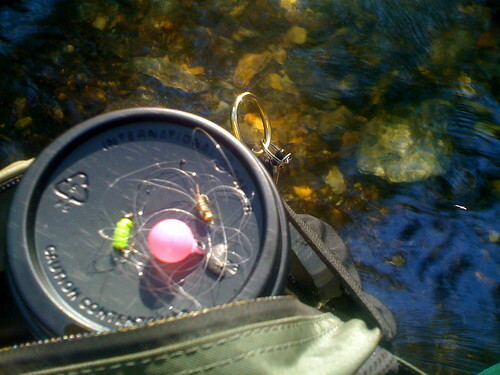 Tricos, Olives and Caddis are still part of the mix. River levels have been a near perfect 115 Cfs with water temps in the 52 to 55 F range. Nymphing the riffles is always a safe bet, especially in the mornings. Terrestrial fishing heats up just about every afternoon…See us before your picnic this weekend! Tricos are still present in the flats from Falls Rd through Bunkerhill most mornings. Caddis in the #16 range have been peeling off by afternoon and are a sure bet in the riffles. 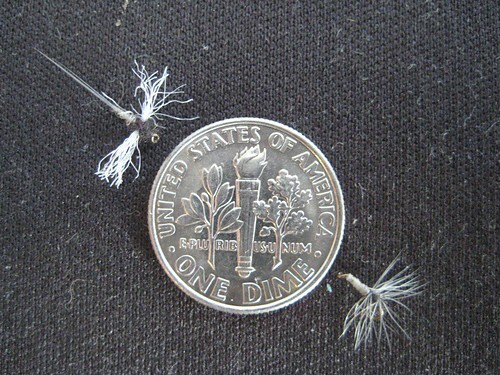 Small streamers along undercut banks will produce fish. Be on the lookout for Wild Turkeys and Blue Winged Olives in the upper catch and release section of the Gunpowder River on cloudy, warm days. This entry was posted in fishing report on September 2, 2011 by Theaux Le Gardeur. Rob from Fairfax, Virginia sent in these kind words about Backwater Angler staff members Josh Reider and Mike Colegrove. They performed yeoman’s work manning the shop while I spent some time down south visiting with my family. Thanks Guys! I live in Fairfax, VA and keep your website bookmarked to help me make it through long days. I was camping up in Freeland this weekend and was excited to finally get a chance to stop by the store for the first time on Saturday. I wanted to write an email for a couple of reasons. The first was to say that the two guys working in the store on Saturday were just the type of guys I would want working in my store (if I owned a store); nice, personable, knowledgeable, helpful. I have also never made it up to the Gunpowder before, and I did walk down to the river with my 6 year old son and wife, and we were totally amazed at how cold the water was, and how beautiful the river was. We went down in the morning, when there was a foggy haze resting on the surface of the water, and sun was just starting to peep through. Too bad my fishing gear is still somewhere in transit from Idaho, but it was still a beautiful morning. This entry was posted in news on September 2, 2011 by Theaux Le Gardeur. Thought I’d send you guys a quick update from the northlands – the headwaters of the Connecticut River. My father and brother drove up to join me not only for a few days of fishing, but for a welcome respite from the heat as well. Our first evening on the water was rather lackluster, with both my father and myself picking up only a few smallish fish. Our second day on the water started very inauspiciously – as soon as I had made it out to the hole that I wanted to fish, I found that my rod had broken! Returning to the water under drab skies, I found that the caddis weren’t really happening as they were supposed to be. So without any real surface activity, I switched to my nymph rig. Initially I tried out my Upper Connecticut go-to, a flashback pheasant tail, but as that didn’t seem to turn any heads I switched over to a small #18 olive hare’s ear, something that could imitate both a caddis pupa and a nymphal BWO. A few casts in and I was hooked up to a decently sized rainbow, an omen of good things to come. Moving up the riffle into deeper water, I watched as my thingamabobber suddenly dropped. When I finally pulled the fish to the surface, I couldn’t believe my eyes – on the end of my line lay an enormous brookie! The rest of the day wasn’t quite as exciting, with both my father and myself netting a bunch of 9-14″ fish first using the small nymph and then switching over to a caddis pattern as the hatch got underway in the evening. We finished the trip out on our third day with a few more decently sized fish, but no more big ones alas. I wish we could have spent some more time fishing in the northlands, but it’s time to go backpacking in the Green Mountains of VT for us! This entry was posted in fishing report on September 1, 2011 by Theaux Le Gardeur.